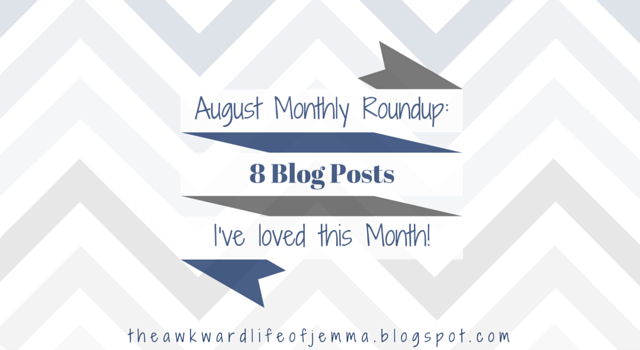 August Monthly Roundup | 8 Blog Posts I've Loved This Month! I'm going to skip the whole 'I can't believe how quick August has gone' and 'What happened to the Summer?' as I'm sure you've heard it enough already and get straight in with this month's favourites! (Secretly though I'm quite enjoying the colder weather, I can't wait to get my tights and jumpers on!). This month I've got 8 blog posts for you that have given me travel inspiration, help with my blog and just plain old interesting reads. I've really enjoyed reading about Katie's adventures in New York but this post, The Ballad of The Misplaced Man, has to be my favourite. A real-life 'Humans of New York' moment photographing a stranger on 35mm film is living the dreams of my former photography student self and I'm keeping my fingers crossed that though the power of the internet, Katie's pictures find there way to the misplaced musician. Zoe London made some really great points this month about how we are A Generation Reminiscing. It is true that we seem to be obsessed with the 90's at the moment (how many Buzzfeed lists can there possibly be?!) and nostalgia in general. This is a topic I'm hugely interested in actually, I even wrote one of my uni essays on our obsession with Instagram and nostalgia! Have a read of Zoe's post and then curl up on the sofa and watch Clueless, you know you want to! The Peppermint Pencil has just kicked off a series called Walk With Me and has given me all kinds of motivation to lace up a pair of walking boots and get hiking. Seriously the views in her images are phenomenal, natural beauty at its best. Speaking of natural beauty, Leah Talks took a cruise through the Norwegian Ffords and made me insanely jealous! A cruise like this is definitely on my bucket list as I don't believe you can truly experience the Fjords any better way than literally sailing through them. I guess this was a month of travel envy because my next two favourites are both pretty mini breaks! First up Sandra over at Cake and Whisky took a trip to the Ile de Ré in France and it looks like the perfect french harbour town. With beaches, markets, pastel coloured buildings and ice cream to boot it definitely ticks a lot of boxes for me! Then the lovely Becky Bedbug spent 48 Hours in Berlin and took tons of great photos to show it off. Berlin isn't one of the places on my list to visit but after reading Becky's post it looks like so much fun and there is so much to see and do! Next up is An In-Depth, Simple and Easy Guide to SEO which was featured on Raspberrykiss this month. I have been meaning to read up on SEO and the like for ages as I really don't know much about it at all and I definitely haven't been implementing it on my blog like I should. This post has given me the kick up the bum that I needed to sort it out and hopefully make it easier for you guys to find me! That's it for this month, let me know which posts you've really enjoyed in the comments!